From Africa to Antarctic, Helen Thayer gives insight to her lifetime as an explorer and adventurer. And coming from someone who scaled New Zealand mountains with Sir Edmund Hillary as a child, earned countless awards in track and luge events, became the first woman to circumnavigate the magnetic North Pole (at the age of 50, no less) lived with ancient tribes across the globe and trekked thousands of miles across multiple deserts, such a statement is an inspiring one. Kicking off her history-making career in famous and dangerous expeditions, 1988 saw Thayer travel solo to the North Pole—without the aid of a dogsled or snowmobile. She did have Charlie, however, the Canadian Eskimo Husky trained by an Inuit polar bear hunter to warn against polar bear attacks and thus save Thayer’s life many times during the trip. From there, she lived for a year in the Canadian Yukon with Charlie and her husband Bill, studying families of wolves. Then, after 4,000 miles across the Sahara, 1,200 miles down the Amazon River and 1,600 miles through the Mongolian Gobi Desert between 1996 and 2001, the Thayers still weren’t ready to stop exploring. Living with indigenous cultures has been an integral part of Thayer’s experiences. Last November, she and Bill lived for a month amidst the Maasai tribe of East Africa, interacting and living without the influence of American culture. “We throw away our Western ways,” Thayer said. “We live as close as possible to the way the tribes do.” This included going on hunts and spending time gathering with the Maasai, and also residing in the huts that they build. “Really, it’s closer to the everyday lifestyle that people used to live,” said Thayer. Helen and Bill are accepted into cultures like the Maasai quite graciously. This is due in large part to the value many tribes place on elder members of society. Had the Thayers begun their visits before their senior years, it is not likely that they would have had the opportunity to immerse themselves as they have. But even with extensive experience and growing comfort with living amongst different tribes, Helen highlights the importance of maintaining humility, though it’s not something she finds difficult. “When we arrive among these people, we have every reason to be humble,” she said. And after being within ten feet of a pride of 14 lions, but knowing that the accompanying Maasai had complete control over the situation, it’s easy to see humility as a trait faced with on a daily basis. 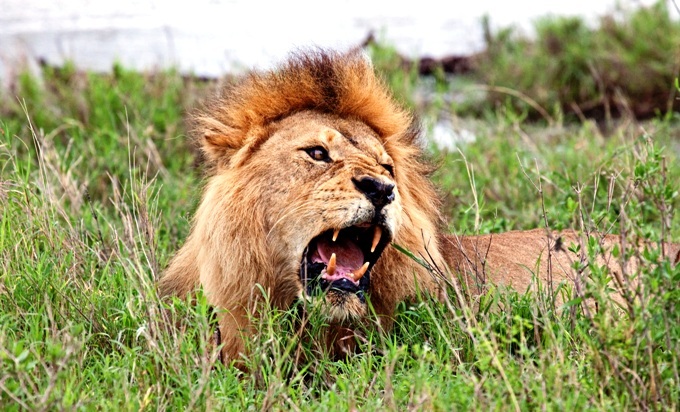 “These people know, they sense things,” she said about the lion encounter. “Eventually, we started to understand. It’s something you kind of get a feel for. 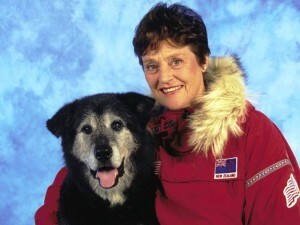 Helen Thayer and Charlie, her Eskimo dog. Their trip last February to live with the Bushmen in southern Africa provided other specificities to adjust to. Thayer said, “We lived as cave people, the life they lived 10,000 years ago.” Living a 10,000-year-old lifestyle indicated the utter lack of any possessions, including utensils. “It took a long time to get used to, because people sort of just reach for food, and you have to learn how to not get pushed out of the way,” she said. The unique language of the Bushmen was another thing to adjust to while staying with the tribe. Composed of a series of clicks, their incredibly difficult language is spoken by very few people in the Western world. It is suggested that the hunters of the tribe developed the language long ago based on the fact that animals don’t register the clicks as they would the sounds used in languages by other parts of the world. Thayer learned some of the language while she resided with the Bushmen. “I try and learn enough to connect on a basic level, but our Africa contact is one of the few people that speaks the click language, so he was our interpreter,” she said. The idea of intercultural respect was one that the Thayers saw a battle with when they visited Alaska to study the Inuit people. After walking and kayaking their way through Alaska to examine the situation with the cultures there, Helen and Bill found that “all of the cultures in Alaska are having problems mixing with Western ways.” While a couple of generations ago Inuit peoples didn’t worry about jobs or even the concept of time, “now those are real concerns,” according to Thayer. These days, those that avoid Western influence and don’t get jobs don’t get money, and now getting money is the only way to get food. Beyond that, alcohol and drugs have become serious issues in the Bush of Alaska—the region where most of Alaska’s native populations reside. Consequently, Thayer acknowledged the presence of a negative attitude toward Westerners. 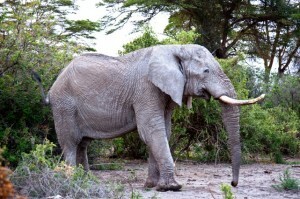 African elephant roaming its home. Such experiences add to the reasons Thayer feels it is vital to enhance knowledge and encourage respect toward cultures other than one’s own. Such a philosophy is what brought about Thayer’s Adventure Classroom, an organization developed not only to teach kids about the world beyond themselves, but also to inspire them to have goals and pursue them. “Americans can learn a tremendous amount from other cultures…and students are extremely responsive to this idea,” Thayer said. “These kids are going to be the leaders of the future, and we want them to learn sympathy to other cultures.” After seeing the resourcefulness and the way in which people learn to work with their surroundings in other cultures, Thayer felt the need to “show kids that we don’t have to be extremely talented, we don’t have to be rich. We can reach whatever our goals are, we just can’t give up.” Adventure Classroom is also a way for Thayer to detail her experiences doing the things that many would think impossible, further inspiring kids to realize the importance of “setting goals, being persistent, and being compassionate to what we want,” she said. Thayer’s long-time affiliation with the CORDURA Brand has also supplemented her Adventure Classroom efforts. “They understand kids and understand the need for education,” she said. Thayer maintains that the quality products the CORDURA Brand offers allow many of her expeditions to run as smoothly as possible. “Our lives depend on good planning, and we’re fortunate these people are here not only as sponsors but to give us the quality gear we need,” said Thayer. Helen’s explanation for her incredible success in all that she’s tackled is simple: “I just never considered giving up. When you give up on your goal, you give up on yourself.” And her to-the-point philosophy is what has inspired people across the globe for years to do what fear tells them they can’t. I just read “Three Among the Wolves” and feel like I’ve met wolves for the first time w/o bias. I loved “Walking the Gobi” because I traveled some of the same area in a van that had engine trouble and can corroborate many of the Thayers’ impressions. I’m so glad they do what they do!